DIE Martis, 6 die Novembris. Spurrier, L. Crew's Servant, Privilege. Jakeman and Dodford committed to The Fleet. Upon Complaint made to this House, "That Arthur Jakeman of Farthingo, and Francis Dodford of Gretworth, in the County of North'ton, have, since the Sitting of this present Session of Parliament, beaten William Spurrier, Servant to the Lord Crewe, a Peer of this Realm, contrary to the Privilege of Parliament; which Offences are confessed by the said Arthur Jakeman and Francis Dodford at the Bar of this House; as also that he the said Arthur Jakeman hath arrested the said William Spurrier since he beat him:"
It is thereupon ORDERED, by the Lords Spiritual and Temporal in Parliament assembled, That the said Arthur Jakeman and Francis Dodford shall stand committed to the Custody of the Warden of The Fleete, during the Pleasure of this House; and this shall be a sufficient Warrant in that Behalf. ORDERED, That the further Consideration of the Bill for prohibiting the importing of Irish Cattle, shall be on Thursday Morning next, by a Committee of the whole House. 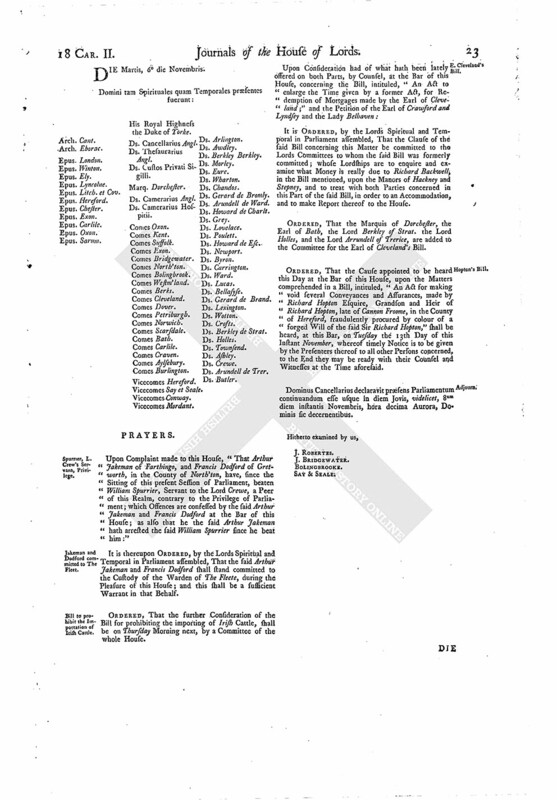 It is ORDERED, by the Lords Spiritual and Temporal in Parliament assembled, That the Clause of the said Bill concerning this Matter be committed to the Lords Committees to whom the said Bill was formerly committed; whose Lordships are to enquire and examine what Money is really due to Richard Backwell, in the Bill mentioned, upon the Manors of Hackney and Stepney, and to treat with both Parties concerned in this Part of the said Bill, in order to an Accommodation, and to make Report thereof to the House. ORDERED, That the Marquis of Dorchester, the Earl of Bath, the Lord Berkley of Strat. the Lord Holles, and the Lord Arrundell of Trerice, are added to the Committee for the Earl of Cleveland's Bill. ORDERED, That the Cause appointed to be heard this Day at the Bar of this House, upon the Matters comprehended in a Bill, intituled, "An Act for making void several Conveyances and Assurances, made by Richard Hopton Esquire, Grandson and Heir of Richard Hopton, late of Cannon Froome, in the County of Hereford, fraudulently procured by colour of a forged Will of the said Sir Richard Hopton," shall be heard, at this Bar, on Tuesday the 13th Day of this Instant November, whereof timely Notice is to be given by the Presenters thereof to all other Persons concerned, to the End they may be ready with their Counsel and Witnesses at the Time aforesaid. Dominus Cancellarius declaravit præsens Parliamentum continuandum esse usque in diem Jovis, videlicet, 8um diem instantis Novembris, hora decima Aurora, Dominis sic decernentibus.